One of the first maps to depict the London Underground. Wyld's New Plan of London. A large and appealing pocket map of London, england issued by James Wyld in 1863. Centered on the Thames, this map covers central London from Paddington Cemetery in the northwest to Hudson Town in the northeast, and from Parson's Green in the southwest to Greenwhich Park in the southeast. This map was issued in the same year that London's Underground, the world's first subway system, was opened. In addition to the original Hammersmith Line, this map also illustrates numerous other proposed metropolitan railroads – most of which had not been built as of the publication date. These include the Charing Cross Station, the liens to Broad Street and Cannon Street stations, and several others. Made with the foreign tourist in mind, Wyld's map shows most streets, important buildings, inns, churches, trading centers, markets, parks, and rail lines. The whole is surrounded by a decorative border bearing engraved views of famous London attractions, including, London Bridge, the Bank of england, The Crystal Palace, the Houses of Parliament, and many others. Secondary and tertiary titles in French and German appear to the right and left of the primary title, respectively. 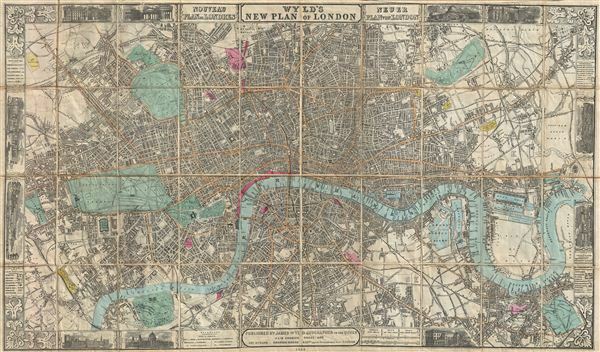 Wyld first issued this map in 1851 and it went through multiple states to reflect rapid urban development that transformed London into the first truly modern metropolis. This example is the 10th state, significant because of its treatment of the embryonic metropolitan transit system. Very good condition. Folds into original binder, which is attached to the upper left panel. Upper margin trimmed close by publisher at top, just right of center - please see image - can be extended for framing purposes. Dissected and mounted on linen. Hyde, Ralph, Printed Maps of Victorian London, 1851 - 1900, no. 24-10.